The advantages to having a mare induced is that if problems develop, help can be right there. But the procedure also increases the chances of complications, writes Dr Robert N. Oglesby, DVM. The most common problem when a mare is induced is immaturity of the foal’s respiratory system, quickly followed by dystocia which risks both the mare and foal. If we had good statistical data it would be a simple calculation to determine which held the greater risk, a problem pregnancy or induced labor. But no such data exists; small studies suggest that as many as 30% will have some complications (see below) and fewer than 10% will have life threatening complications. Of course if some problem in the mare has been identified that you know will cause problems at birth the choice is easy, you induce. Mares with a history of neonatal isoerythrolysis, severe past vaginal trauma, may fall into this class. Repeated episodes of premature separation would fall into this class, but I am not sure after one episode it is indicated. Prolonged gestation, up to 390 days, is not an indication for induction. Mares going over a 12-month gestation are not that uncommon and not associated with problems as long as they have not been on fescue since their ninth to 10th month and no other health problems are present. 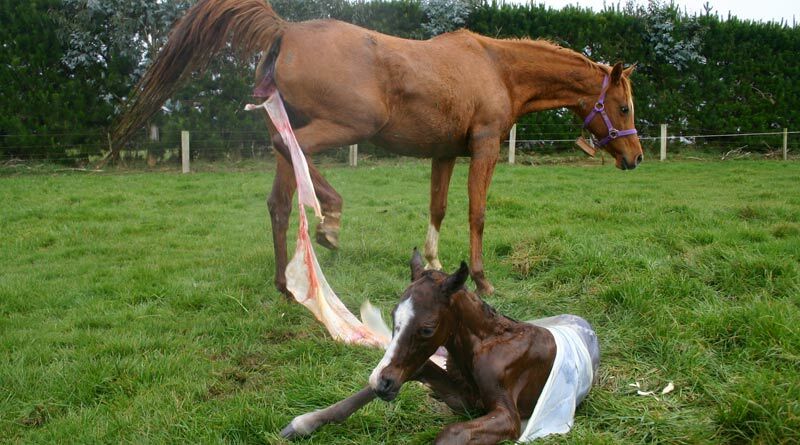 There are some things that can be done to help decrease problems associated with induced foaling. The most important is to ensure the fetus is mature enough to make it on its own. Fortunately this is not hard. There is a strong correlation between changes in the electrolyte concentrations in the mammary secretions and the foal’s maturity; particularly the concentration of calcium and the ratio of sodium and potassium. Calcium concentrations are easily monitored with Softcheck Test Strips. Dilute the milk sample with double distilled water with one part milk to 6 parts water. Dip the strip into the solution and when the hardness rises above 250 ppm parturition can be induced. Many techniques have been used. The most common are those using oxytocin. It has been widely held that slow IV drip had fewer complications over bolus injections of oxytocin. Usually 75 IU of oxytocin is used given either as a single intra-muscular injection, divided into 15IU IM injections and given every 15 minutes, or slow IV drip given over an hour. Recent work with a small groups of mares (16) suggest this is not true. All groups of mares undergoing induced parturition with oxytocin had a high incidence (roughly 33%) of dystocia, premature separation of the placenta, and neonatal abnormalities: decreased oxygen, increased CO2. Though taking longer, all abnormal foals were able to stand and nurse, though some required assistance. One of the predictors of problems was a closed, tight cervix. Recently single low dose, 20 IU, oxytocin treatment has been advocated for mares prepared to foal. Usually labor begins in 15 minutes and is completed in an hour. The other technique uses the prostaglandins, prostalene (4mg. SC) or fenprostalene (two 0.5mg. doses SC at 2 hour intervals). Mares will usually foal within 4 hours. As long as the mammary secretions indicate the foal is ready the prostaglandin method may have a lower incidence of complications than oxytocin. The complications associated with induction have been: prematurity, failure of passive transfer, myometrial spasm, premature separation of the placenta, malpresentation of the foal, and retained placenta. The best ways to minimize complications are to be sure the foal is mature and the mare ready.